It is written in both Chinese and English so this short book is in use shorter still, given the likelihood that most users will only utilise half of the text. There is a section on silk reeling exercises, single and double hands as well as stepping silk reeling exercises. The most significant part of the book is a description with pictures of Chen Zheng Lei’s beginner’s / introductory 18 step form. A student attempting to learn from this book alone would be frustrated. A student learning this form from an experienced teacher would find it useful as a set of course notes. In many respects this book is surpassed by the several DVD’s available on this form. Nevertheless it is a useful record set by the designer of this form. The volume has plenty of high quality pictures and (translation excepted) some interesting descriptions of what the student is aiming for inside and outside their body initially. 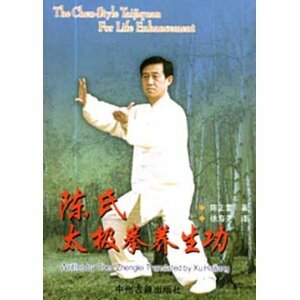 It does not set itself out as a definitive work on taijiquan and this is one of its strengths. It aims at the beginners and restricts itself to that information that is pertinent to the beginner.